This was posted on my friends mother’s Facebook page. 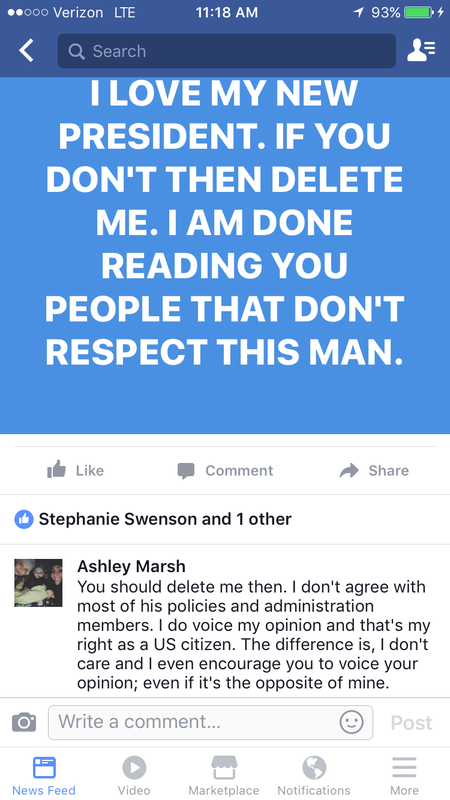 I knew she was a Trump supporter and I never cared or thought less of her. The ending to this story is that she did delete me. I guess she can’t handle seeing someone disagree with her or have differing views. It is upsetting that people don’t want to be “friends” or hear someone else’s views simply because they don’t align with their own. My husband and I don’t always agree politically but we make it work. We disagree on some pretty big social issues, but we don’t let that get between us.